If you are parked at the lower parking area, walk 0.2 mile further west along the road until you reach the upper parking area on your left. The Long Trail heads north into the woods from the end of this upper parking area. Follow the obvious and white-blazed trail uphill into the woods. 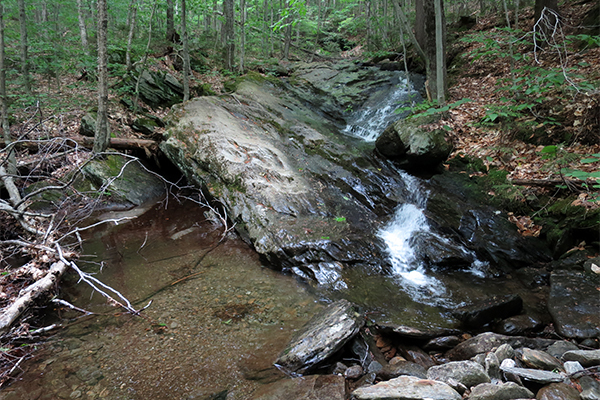 After 0.2 mile, follow a rough spur path on your left for 50 feet over to the brook, where you will see an 8-foot slide just downstream and some tiny cascades upstream. This spur path is right before where the trail starts climbing more steeply than it has to this point. 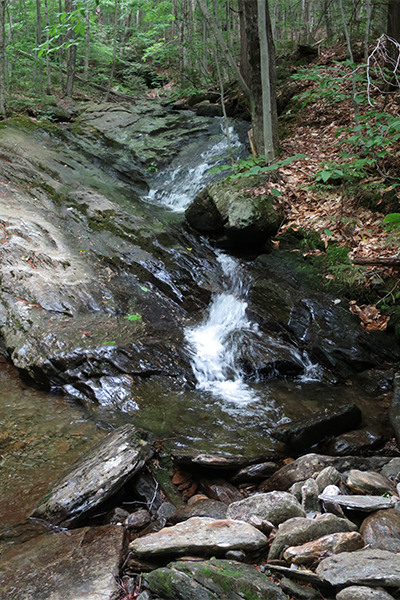 Additional small cascades can be found in a gorge just upstream, but there is no path and views are limited. I personally did not feel that bushwhacking along the gorge was worth it, but perhaps you will? None of these cascades and slides can be seen from the Long Trail itself. You must follow rough paths or bushwhack over to the brook to see them. The best view of any of the cascades here is from downstream of the 8-foot slide at the end of the cascades. From the junction of VT 109 and VT 108 in the section of Cambridge known as Jeffersonville, follow VT 109 north for 6.0 miles and turn right onto Codding Hollow Rd. If you are traveling south along VT 109, Codding Hollow Rd will be on your left 8.5 miles beyond the junction of VT 109 and VT 118 in the section of Belvidere known as Belvidere Commons. Follow Codding Hollow Rd west for 2.3 miles (forking right after 0.8 mile and left after 1.3 miles to stay on the road) and you'll reach the lower parking area on your right. 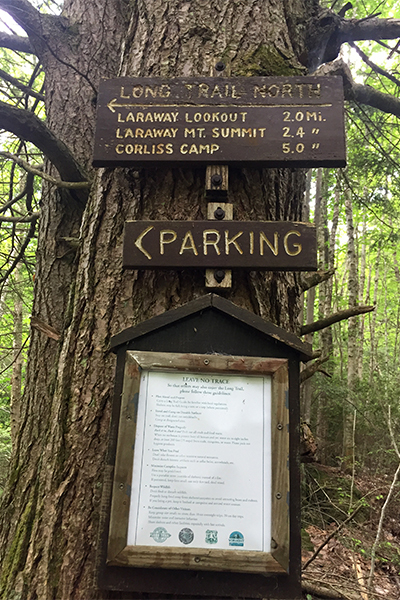 The lower parking area is currently marked with a sign for the "Long Trail State Forest: Codding Hollow Trailhead" as of 2017. If you have a low clearance vehicle, this is the place for you to park. If you have a moderate or high clearance vehicle, you can continue 0.2 mile further up the road to an upper parking area on the left. To get Jeffersonville, take VT 15 east from Burlington or VT 108 north from Stowe. Several great day hikes are possible from this section of the Long Trail. You can hike the Long Trail north to views from Laraway Mountain, or you can hike the Long Trail south to Prospect Rock.